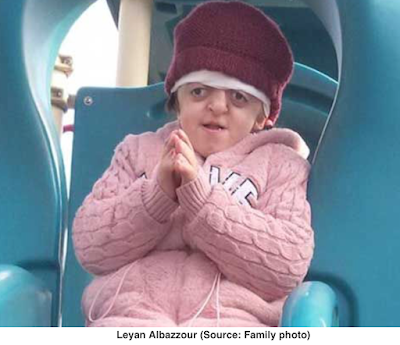 A child from Palestine, born with Apert Syndrome, will undergo surgery in Kentucky at Norton Children's Hospital in Louisville. Dr. Ian Mutchnick met Leyan Albazzour while performing neurosurgery overseas in the West Bank. Leyan's brain began developing, but her skull did not. She was affected by developmental delays and pain. Dr. Mutchnick could not bear to see her in pain and knew he could help in the form of a cranial vault expansion surgery. Learn more about Leyan's experience in Louisville, Kentucky at Norton Children's Hospital in this article. Part of a successful education involves teaching students to look beyond themselves and to use their knowledge and abilities to help those around them. Each month, our school emphasizes a specific character trait that we want our students to live out. Our character trait for December was Giving. When we found out that one of our students, Jordan Watkins, was trying to raise money to help an organization that has helped his family and so many families who have been affected by facial differences, we knew this would be an awesome opportunity to demonstrate giving in a real way. 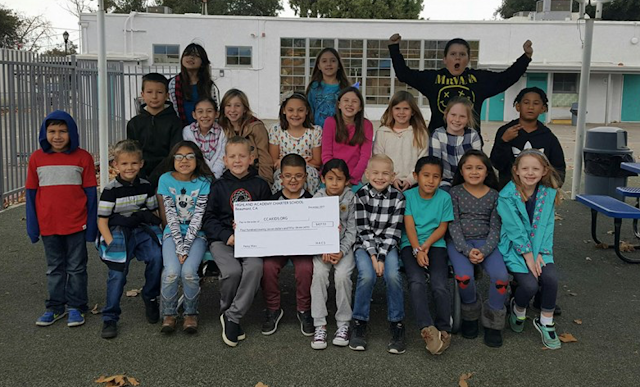 When we announced that our giving project was to raise money to help Jordan and the CCA, the enthusiasm and response from the students was overwhelming. Every day for two weeks, students brought in change. At the end, they had raised over $400. We are so proud of our students for the invaluable life lessons they learn each time they help others. We are also so privileged and thankful to help the Watkins and the CCA. Thank you for giving so much of yourselves to affect change, impact growth, and provide hope to so many children and their families. 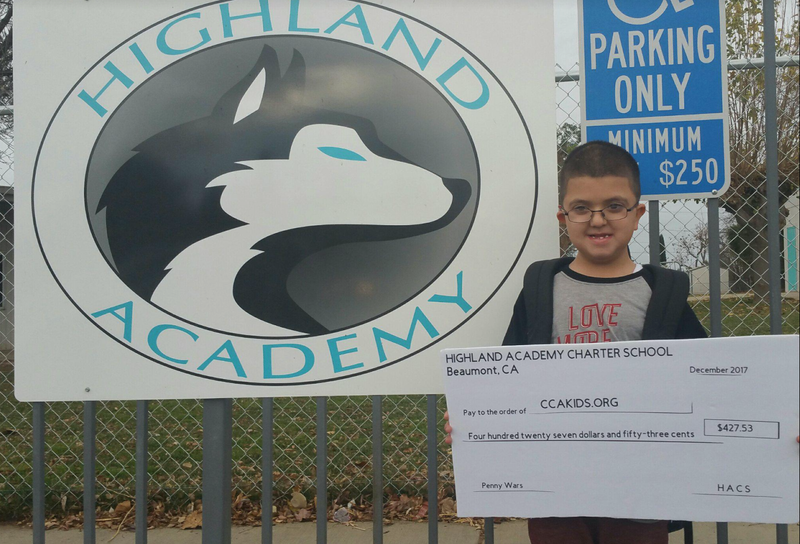 Help CCA get "Wonder" into more schools, help kids like Jordan and his teacher Ms. Spellman teach lessons that last a lifetime. 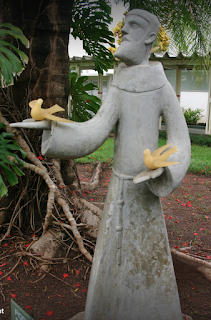 Click here to donate today! It's March Madness! 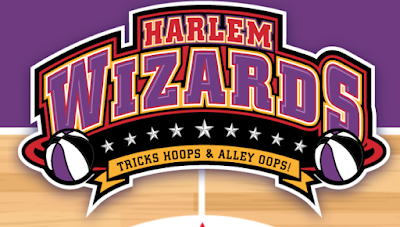 Whether you love basketball or enjoy comedy, dance, and music, you are guaranteed a fun night at the upcoming Harlem Wizards event in Wylie, TX on Tuesday, March 20th at 6:30PM at Wylie High School. 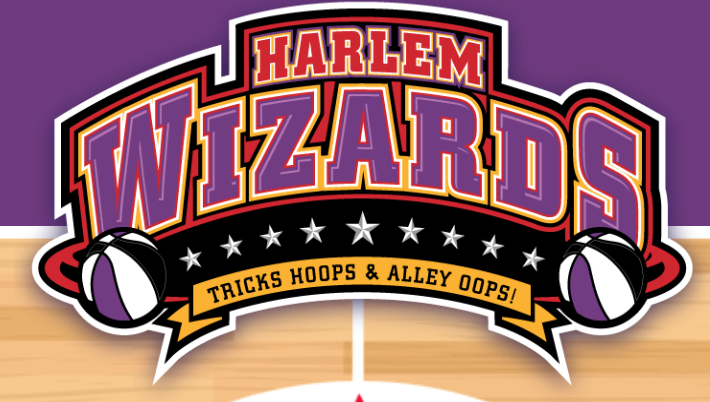 The Harlem Wizards are a show basketball team founded in 1962. The Harlem Wizards are similar to the Harlem Globetrotters, but just a little bit different and a bit more of a grassroots organization. That said, some of their players have hooped it up with the Globetrotters. 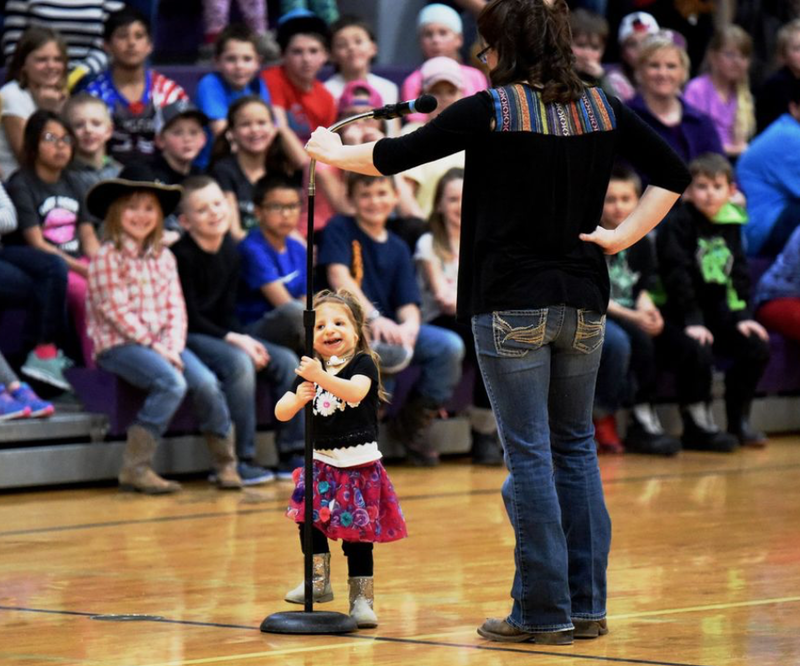 They travel the country bringing smiles to kids and adults with their motto "your smile is our victory." The Wizards are super excited about their upcoming Texas Tour. We will be playing in Wylie, TX on March 20th at 6:30 pm. The Wizards like the rest of the country saw the movie "Wonder" and loved the message of kindness. They wanted to use their platform to reach out to CCA kids and families and give them 2 hours of pure fun! Here is a link to our website to learn more about us: https://www.harlemwizards.com/. We travel all over the country and have been to 20 countries worldwide. Contact Manu Iyer if you are interested. They are inviting CCA families to the game for free. They will give you tickets to attend the game and some other Wizards souvenirs. An article published on The Conversation, "an independent source of news and views from the academic and research community, delivered direct to the public," outlines important psychological findings about children born with facial differences. Thankfully, most are positive revelations. Those with facial differences were found to be more mature and accepting of their bodies. Read more in the article to reveal the research that supports these theories. Three cheers for resiliency and leading the way towards self acceptance. Shane Merem of Storm Taekwondo located in Commerce Township, Michigan held a kick-a-thon at his studio with students of all ages and talents, raising over $5,000 for Children's Craniofacial Association. Their efforts will help send Brooklyn Wojtyniak's family, and other families to Annual Retreat and Educational Symposium. The event was streamed on Facebook. Merem asked the Facebook audience for contributions. Then introduced the kids and adults that would be showcasing their karate kicking skills. Finally, each student had their moment in the limelight as they raised funds with each kick. 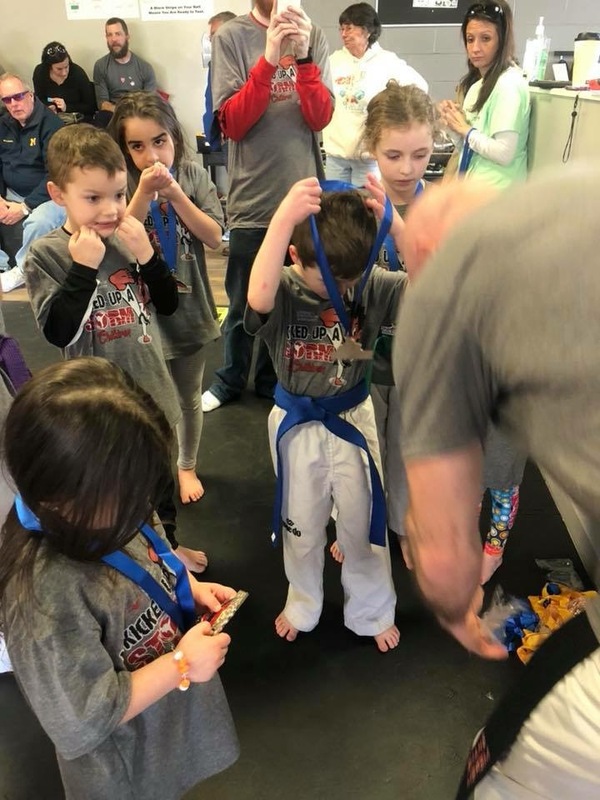 Prizes were then awarded. 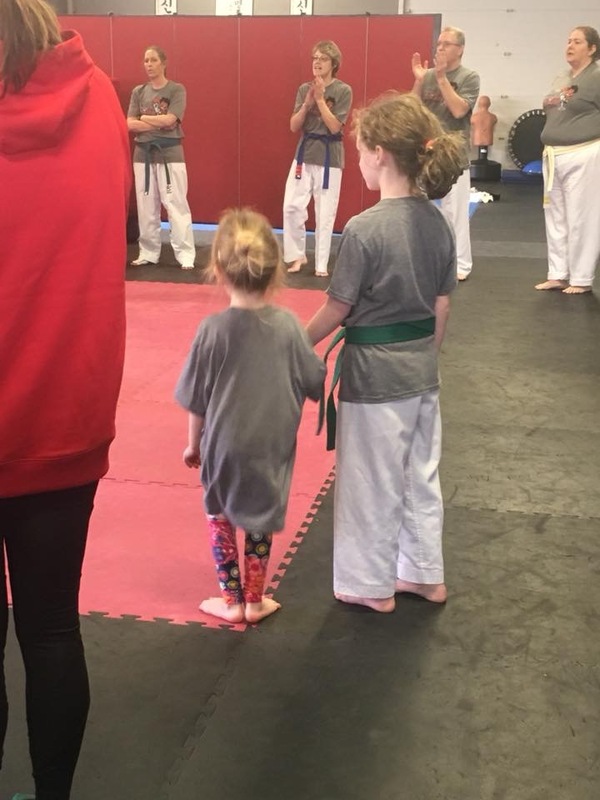 Some students even completed a portion of their kicking at home to be sure they made all the karate action happen for their donors. Merem is a passionate individual. He is very motivated to give the students not only the physical tools for success, but the mental motivation as well. He is force with which to be reckoned. Merem heard about CCA from one of his students, Brooklyn Wojtyniak. The goal was to send her and her family to retreat, but Storm Taekwondo did so much more than that in raising so much awareness and generating so much kindness and helping Brooklyn attain the Retreat Room Reward for netting $5,000. Generous prize donors offered up incentives for individual and team donors that gave the most money. 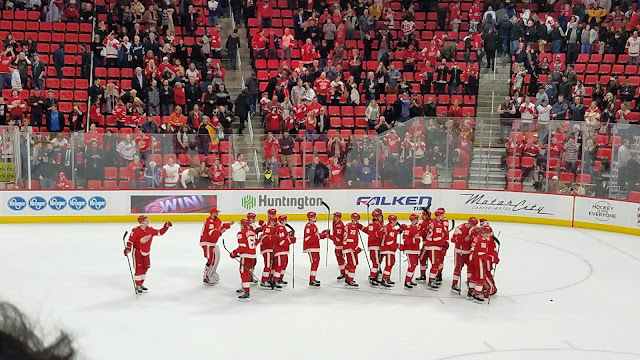 One team earned the ability to to attend a Red Wings hockey game thanks to Ben Marcum's boss at INTRA Corporation in Westland, Michigan. Looks like these big earners had a great time at the game. 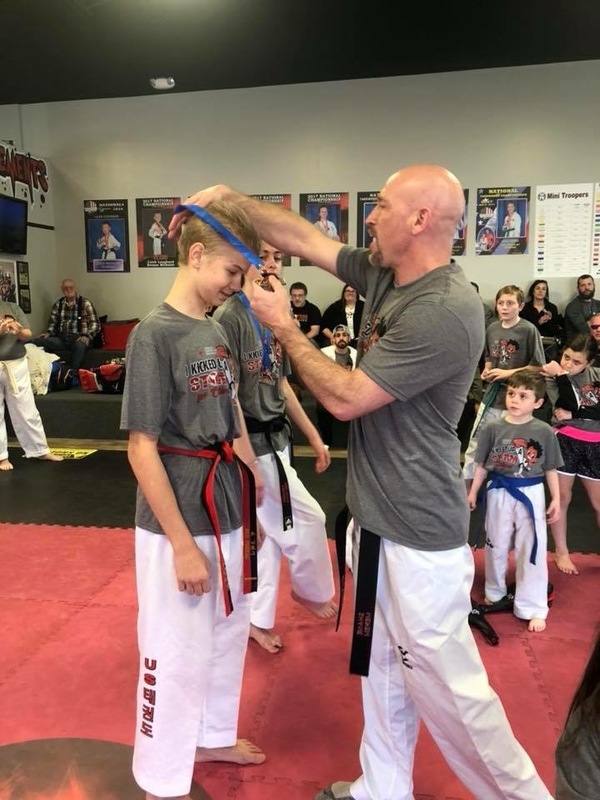 Marcum praises Shane's efforts by saying, "Shane is an amazing Martial Arts Instructor and his school is growing and doing an amazing job developing young kids into champions of life." Marcum also states that Shane recognized how important the Annual Family Retreat and Educational Symposium is to the our families. Watch the video of the Kick-A-Thon Live Facebook event by following this link. This is a great model for future fundraisers. 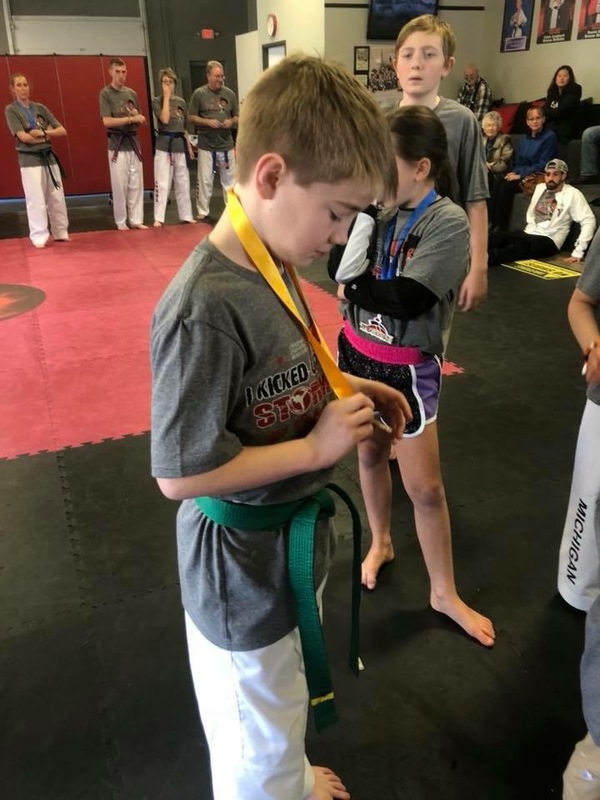 If you have a studio, Storm Taekwando is willing to walk you through how to run such a fundraiser. 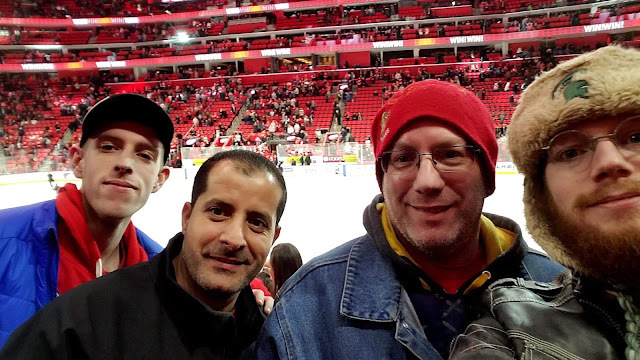 A sports or activity-related fundraiser like this allows many people to get involved, give reasonable amounts of money that make sense for them, and can be completed in a number of different venues. It could be any repetitive activity. You could do a dance-a-thon, basketball shot-a-thon, or even a yoga pose--a thon! Each person sponsors a specific number of shots, or length of time that the participant spends completing the activity. People can donate one unit, or more, depending on the metrics you develop. Excellent job and many, many thanks to Shane Merem, Storm Taekwando, all the kick-a-thon participants, and Ben Marcum for their thoughtfulness and generosity. 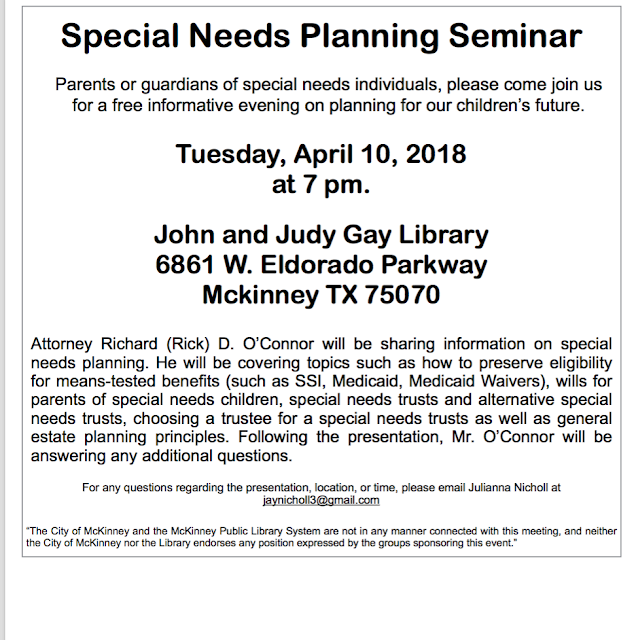 Learn from Attorney Richard O'Connor, how to best plan for kids and adults with special needs. 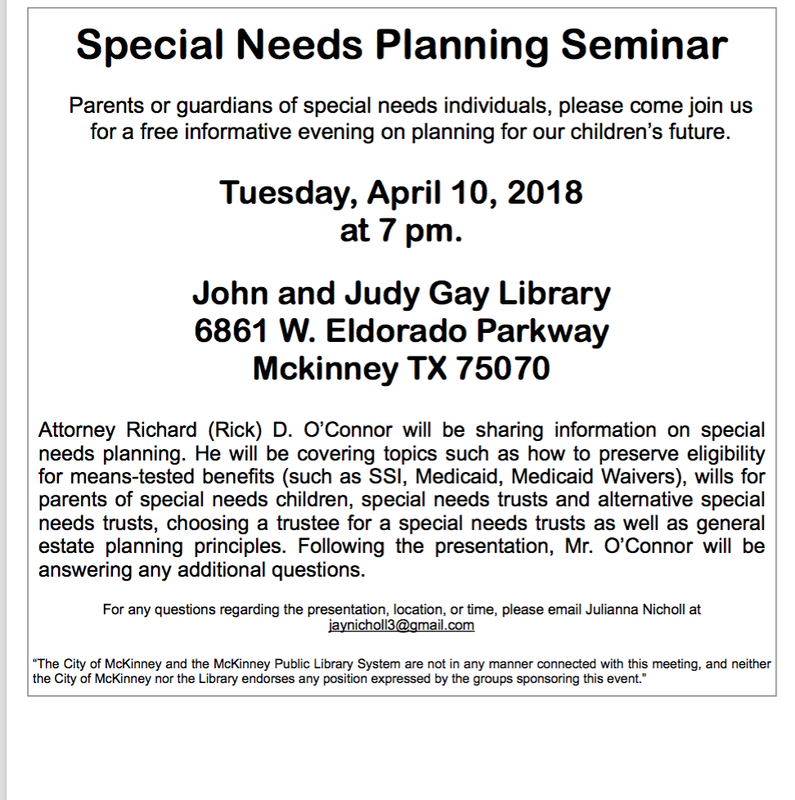 Navigate the muddy waters of health insurance, medicaid, social security and more during this informative seminar. Contact jaynichol3@gmail.com for more information about the event. 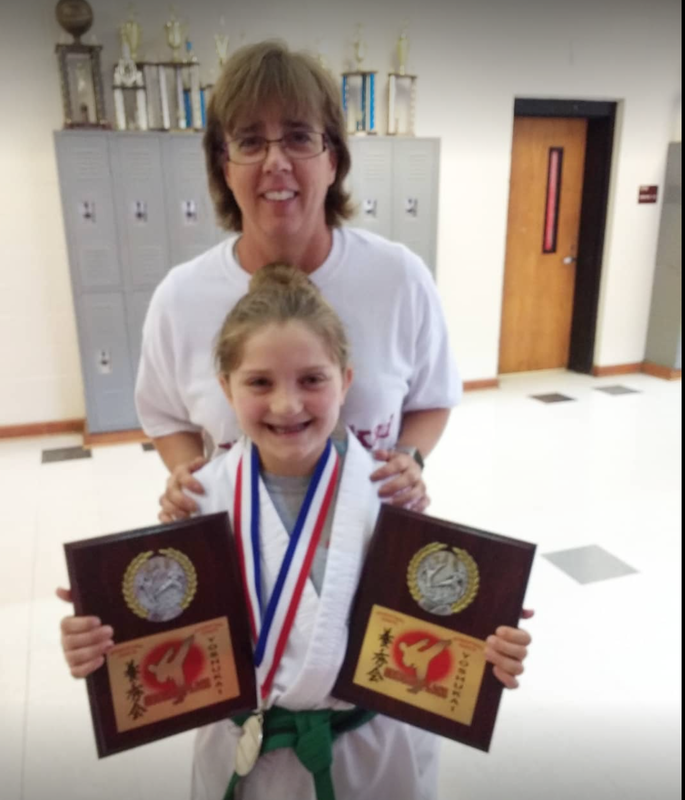 Sydney Ford and her karate teacher found out they have more than just their shared love of sport in common. 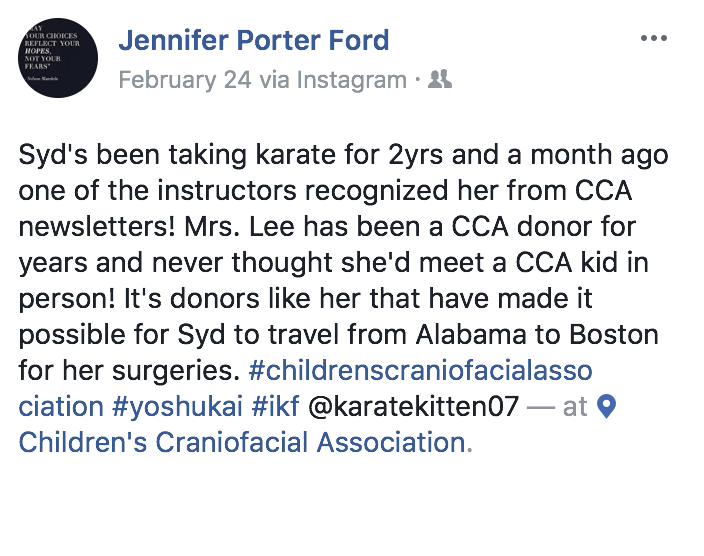 They also love Children's Craniofacial Association. 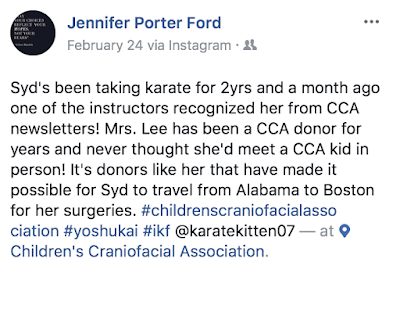 Sydney benefits from the organization's medical travel funds that her karate teacher, Ms Lee, funds through her donations. What a small world? If not for donors like Ms. Lee lots of kids like Sydney could not access the medical care they need to stay alive. Meanwhile, others would never have been exposed to the book "Wonder." 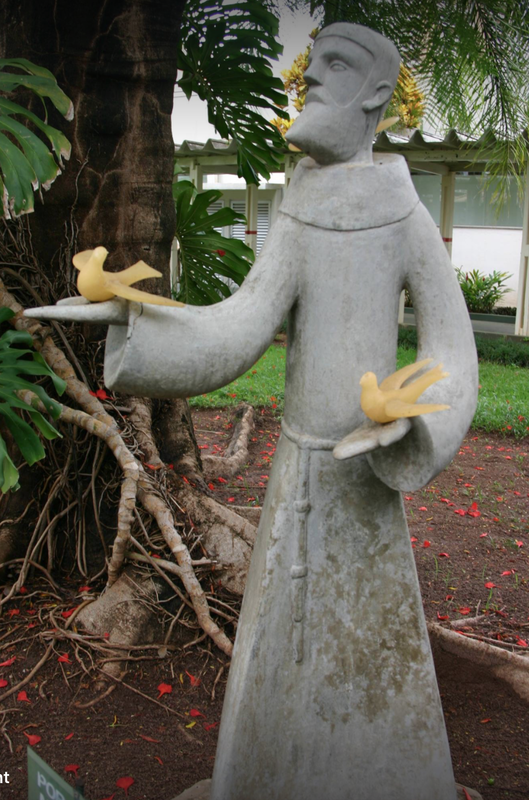 We are grateful for all of our donors, but especially those who donated to us for many years.